Undoubtedly, you already know at least a little about her horrific week. But in case you don’t, Michael Wilson of AFL Media shot and published a spectacular photo of Harris in action for Carlton that reminded many of the sport’s followers of the classic pic of Ted Whitten in flight for the Footscray Bulldogs back in the day. Unfortunately for everyone, it reminded the lowest dregs of society that like the rest of her league, Harris is female, and for that particular facet of the population, the only use for women is for their personal gratification. And while it seems impossible to conceive of such a Neanderthal set of individuals, there are members of that repugnant subset of our species who can use the internet and type out the thoughts which emerge from their tawdry excuse for a brain in the comments. This caused Harris understandable consternation, and it then made her the target of a second wave of emotions. This time, it was a flood of support for her as an athlete, as a woman with dignity, and as an outstanding representative of the sporting community as a whole. There have been a slough of articles, podcasts, and other opinions expressed on the topic, including mine. And without any input on Harris’ part, she has continued to be the centre of attention throughout the week because of factors beyond her control. Now, I’m going to take you somewhere dark and dank, somewhere nobody should ever have to go alone: into the recesses of my brain. As I was watching Carlton take the lead and slowly pull away from favored Fremantle, I noticed that I was paying more attention to Harris than normal. But as I continued to watch, I found I was barracking for her more than I normally would. And in analysing the reason, I was disturbed to realise that this was because I had developed the false idea that somehow I knew her better today than I had a week ago, when in fact that wasn’t really true. Nothing had come out about her life, her personality, or anything else except that she has the strength and temper to call out the trolls for who and what they were. That she has a heart for the people who had to live with those trolls, and worries about them. That she can kick a footy a lot further than I ever could. Actually, I knew this before, but the photo emphasised that fact for me. And that’s literally about it. I don’t know anything new about her as a person, or about her interests outside of the sport, or what her family is like. I have no idea about her politics, her pets, or hobbies, or anything else. Off camera, she might be Mother Teresa, or she might be Genghis Khan. I have no idea. Yet my brain had the audacity to claim that I somehow ‘knew’ her now, because she had gone through this public trauma in plain sight of all of us. My brain told me that I now knew enough to have some kind of connection to this young woman, because ‘we’ somehow went through this trauma ‘together’. Besides being obviously absurd, isn’t that merely a slightly less terrible version of what the internet trolls subjected her to? Because there was this photograph of her online – presumably placed there without her explicit permission, since she’s a public figure – that happened to show her in an elongated athletic pose, those mouth-breathers felt they ‘knew’ her well enough to make public their opinions about her, and spoke accordingly to their fellow delinquents? And the argument extends beyond this one athlete. Don’t we do that with any athlete, singer, actor, rapper, politician, public figure, or whatever the Kardashians are? Because we see them on our screens, we feel we must know them in a way that we only really know the actual human beings we physically interact with in real life? Or is it that we don’t even know our actual friends that way anymore either, and we’re operating under this illusion about everyone in our life, except perhaps our immediate family and intimate acquaintances? How many of your Facebook ‘friends’ have a pet? Ignore the three most common contacts, then look at the next ten names. How many of them have a pet? Do you know, or are you guessing? We see Tayla Harris interviewed after a game, and we feel empathetic for what she’s going through. And yes, that’s in the present tense – she’ll have to deal with this topic for the rest of her athletic life, and then whenever someone she meets Googles her. Yet we too make assumptions about her that we probably have no right to make. Just because our assumptions are more positive than those of the trolls, they still shouldn’t define her in our minds or anyone else’s. Commercial endorsements feed off these unconscious associations all the time. We want the products that are associated in our minds with the star athletes or actors with whom we attribute positive impressions, and we reject products we associate with those we disapprove of. The brain is a weird piece of meat. Unless you’re a friend or a family member of hers, you probably don’t know Tayla Harris any more than you knew her two weeks ago, no matter what you think. All I really know about Harris is that she’ll probably be on the losing team come Sunday. 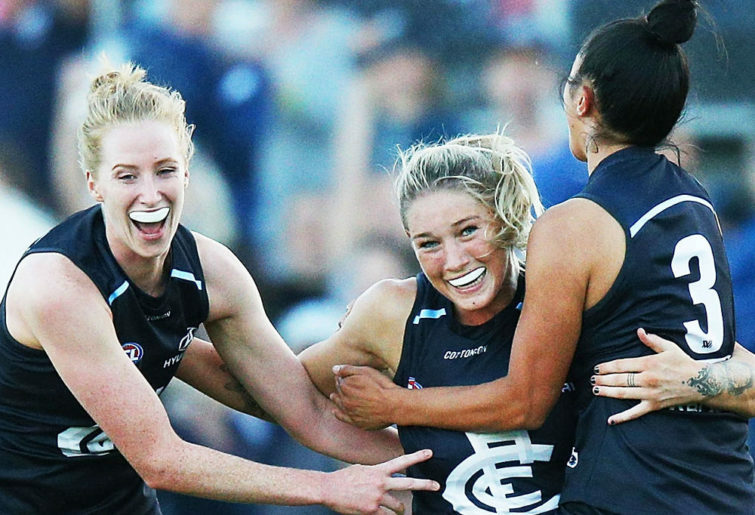 Our ELO-Following Football rating system has the Crows as a 29.5-point favorite at home against the Blues in the AFLW decider. As good as Carlton looked on Saturday against a powerful Fremantle team, Adelaide was utterly Panzer-like in its blitz of poor Geelong. That record point spread of 25.5 was surpassed before half time, and it was literally 67 to zero before the Cats got off the mark, only to register the worst score in AFLW history. It’s a sign of the split nature of the transition between playing styles this season that we’ve spoken of often: even though the average score is higher than ever, and some teams are breaking positive records for scoring, the dubious record for lowest score in a game has been recorded, tied, and surpassed over the last few weeks. So the official prediction is another Adelaide victory – the first team to win seven times in a season will become the first to win eight times next Sunday, defeating Carlton with only slightly more difficulty than they beat Geelong with. Thirty points is about right – the game should look like the Carlton-Fremantle game did, except with the Blues tasting what the losing side feels like this week.